Sail Area circa 4,700 Sq. Ft.
MISCHIEF defeating the Canadian yacht ATALANTA and the American yacht GRACIE in the second and deciding race for the America’s Cup in the 1881 Match sailed on November 10th over course, 16 miles to leeward of Sandy Hook Lightship and return, the winner finishing 38 minutes, 54 seconds (corrected time) ahead of the challenger and 10 minutes, 5 second (corrected time) ahead of GRACIE. In this, the deciding race, a fresh breeze forced all three yachts to douse topsails and reef on the beat to windward. In the first race sailed November 9th over the N.Y.Y.C. inside course, MISCHIEF defeated ATALANTA by 28 minutes, 20-1/4 seconds (corrected time). In both races the American yacht, GRACIE, sailed the course and was timed by courtesy of the Race Committee. In the first race GRACIE actually succeeded in defeating MISCHIEF by 6 minutes, 27 second (corrected time). The 1881 Match was Canada’s second assault on the Cup, and was arranged only after much letter writing and considerable caustic comment in the press of the United States and Canada. The two yachts were not only the first sloops to sail for the trophy but were the smallest that had so far competed. The Canadian challenger was beset by many difficulties and her designer and builder, Alexander Cuthbert of the Bay of Quinte Yacht Club, did not get her finished until October. Instead of bringing ATALANTA via the St. Lawrence and ocean highway, she was brought to New York through the Erie Canal. She was so wide that to get her through the Canal locks it was necessary to lift her over on one side by shifting her ballast. She arrived after the yachting season was over and the races had to be sailed in November in stiff breezes. 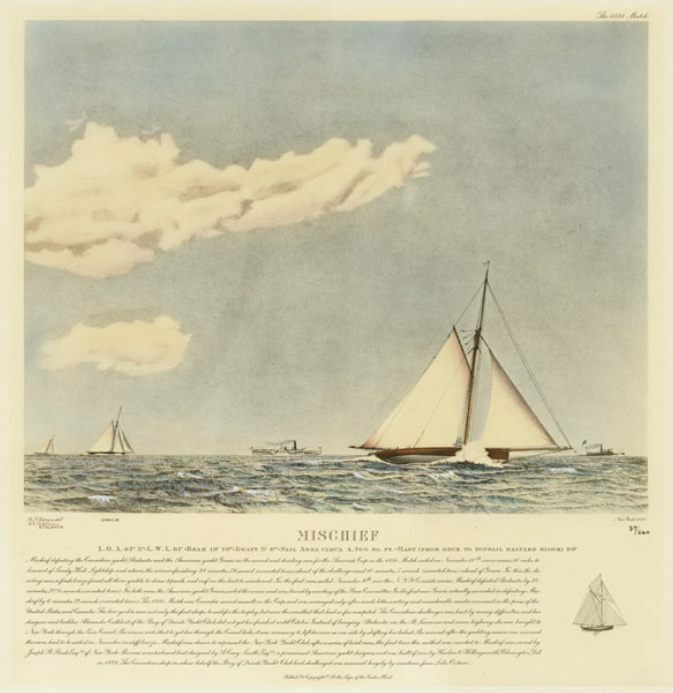 MISCHIEF was chosen to represent the New York Yacht Club, after a series of trail races, the first time this method was restored to. MISCHIEF was owned by Joseph Busk, Esqre. Of New York. She was a centerboard boat designed by A. Cary Smith, Esqre., a prominent American yacht designer, and was built of iron by Harlan and Hollingsworth, Wilmington, Del. In 1879. The Canadian sloop in whose behalf the Bay of Quinte Yacht Club had challenged was manned largely by amateurs from Lake Ontario.